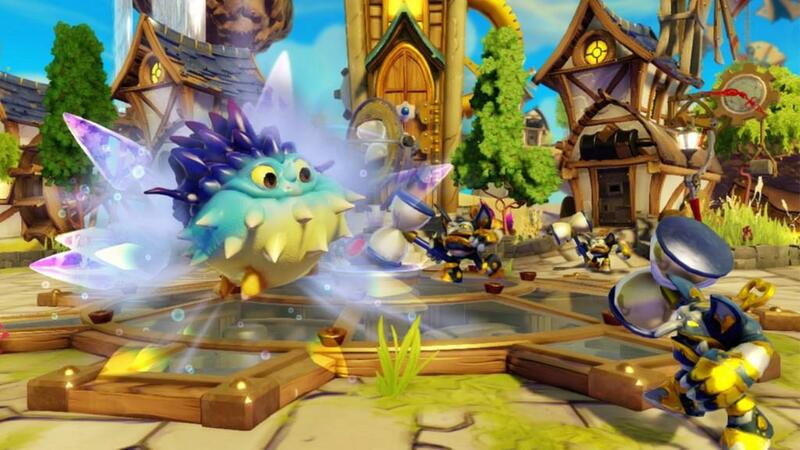 As I eased into the third game of the Skylanders franchise, I had a wave of familiarity come over me, as if I just reconnected with an old friend and we picked back up like they had never left. 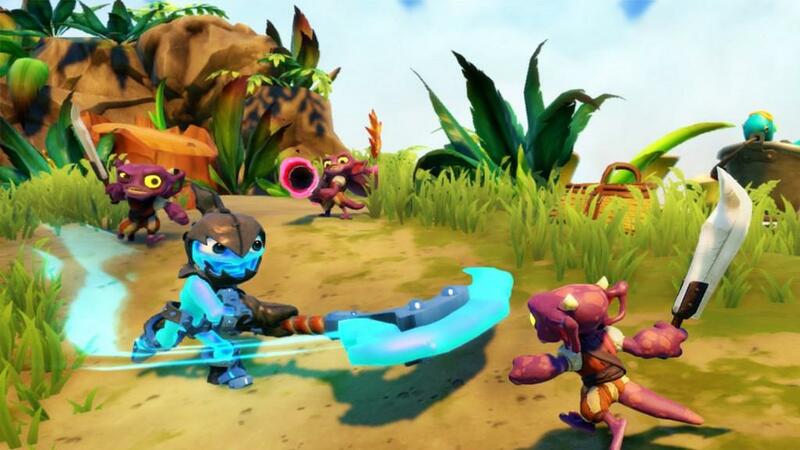 However, the deeper I got into the game, I started having something tugging at the back of my brain that I hadn’t yet felt while reviewing previous Skylanders titles, a bit of disappointment. Although I have some concerns about where the franchise is headed (check back later this week, as I will have a full article up on my concerns regarding the long-term health of the Skylanders franchise), Skylanders Swap Force is just as fun to play and visually appealing as the first two titles were and will keep you entertained for hours. 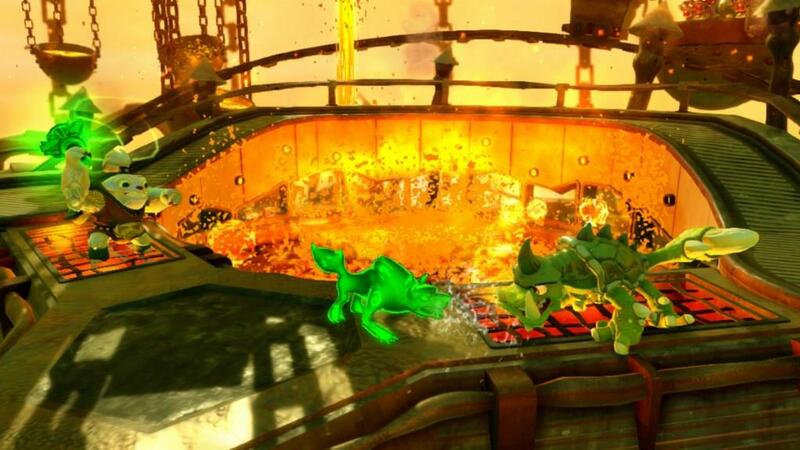 I had a chance to review the Xbox 360 version of the game (developed bu Vicarious Visions) and had several Swap Force figurines and a couple years’ worth of Giants and base Skylanders at my disposal as I made my way through the review. For those that are thinking of purchasing it, the starter packs for all the console versions are ~$75 and all are packaged with two Swap Force characters (Blast Zone and Wash Buckler) as well as the Series 3 Ninja Stealth Elf. Unfortunately, the people that have been collecting since day one get a third version or Stealth Elf, even though the previous two still work. Activision did finally get with it on the 3DS version (review coming later), by packaging completely different figurines with the thought that console owners also will buy the 3DS portable version as well. As for the Xbox 360 version, even though the vast majority of the game carries over the previous versions, there seems to be a more refined feel to it as the dialogue is improved, the storyline has a bit more depth and the missions are longer. Things that have changed include adding more required use of Skylanders from previous titles (chests that require Giants to open them), an increase of the Skylanders level cap and all new mini-games and challenges. 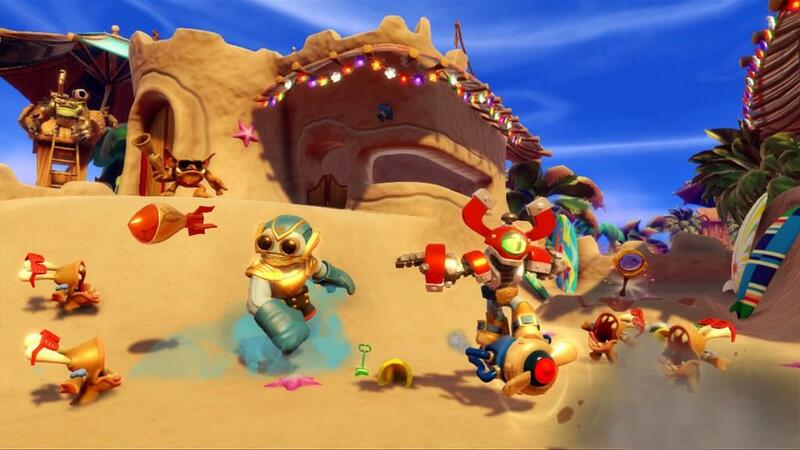 Although the underlying fundamentals of the previous Skylanders games have remained intact for Swap Force, the star of the franchise will always be the Skylanders figurines themselves. That is why it is not a surprise that the Swap Force integration represents the bulk of the newness that the game exhibits. With each new iteration of the Skylanders franchise we get new figurines to play with. While many have been re-releases of previous series, we do get the new Skylanders figurine that corresponds to the title they originated with. To date, we have seen series 1, 2 and 3 base figures, LightCore, Giants and now Swap Force, each with their own unique ability or design. While all previous figurines were pretty straight forward, I had a concern with the Swap Force figurines around how the top and bottom halves will align and stay together while constantly being pulled apart and picked up and set down. After spending many hours mixing and matching combinations, the dual magnet system that holds the halves together is designed exceptionally well. I did not experience any looseness or have any Swap Force figurines come apart when I picked them up. The design works well aesthetically too, as combining even Blast Zones’ robot parts with Wash Bucklers’ squid legs doesn’t look outlandish on the screen or sitting on the portal. I had access to four Swap Force figurines, and my above statement on aesthetics and connectivity held true in all swapped scenarios, regardless of the combinations I came up with. I also wanted to point out that the portal itself has evolved with Swap Force. While the Xbox 360 version is still wired, the portal is a bit shallower and wider. It is also made more cheaply (not that this is a problem) and much lighter than the previous versions. I will assume that these changes have led to lower manufacturing costs, although it certainly hasn’t led to a decrease in the base price. Overall, it works just fine and the LED lights that make it glow like a disco ball are just as bright and colorful as ever. The story mode in Skylanders Swap Force is based off the premise that a bunch of Skylanders fell into a volcano many years ago and gained the ability to swap with their counterparts to create unique powers based on who’s bottom half of their body they swapped with. Thus, the Swap Force Skylanders were created and are needed to save the world. Predictably, Kaos is involved again; causing ruckus and mayhem with his army of Chompies, Greebles and other minions and once again your army of Skylanders is called upon to take him on. Similar to Giants, Flynn is featured very prominently as the primary protagonist that drives the story. It starts off with Flynn waiting for a 100-year eruption of the volcano that created the Swap Force Skylanders and somehow getting himself caught up in plot by Kaos where he needs to rescue a village that has been raided and its elders taken capture by his bad guys. As the franchise has evolved over three titles, so has Flynn. While most thought he was a bit overbearing, borderline annoying in the original, his evolution to the primary protagonist (the good guy directing the show) is not a surprise. Many previous non-player characters (NPC) from the other two games make cameos at some point, as Master Eon, Cali and Hugo in addition to Kaos all pop up right out of the gate. However, you find a whole lot of new friends and a new world to explore. 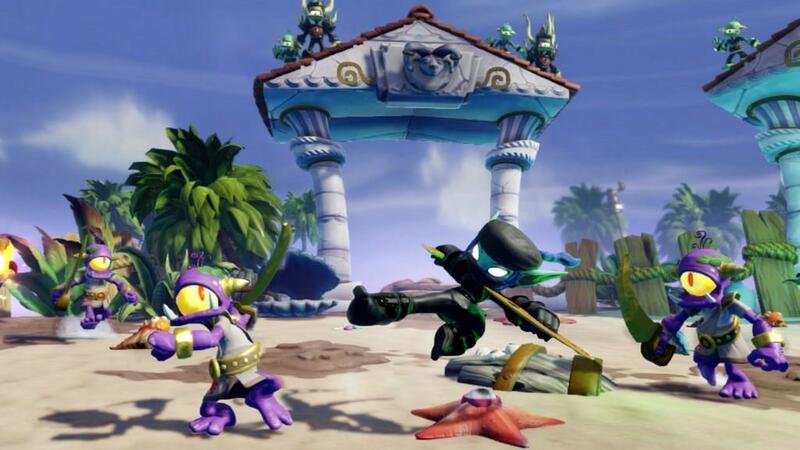 I won’t go too in-depth with the actual story mode game play, but each chapter will contain multiple areas (many locked that only specific Skylanders or combinations of Skylanders can access), the need to collect hidden items, trying to find hidden areas, multiple challenges and several mini-game puzzlers that need to be solved in order to get to the end. The one good thing is that almost all the challenges and mini-games have been updated to something new, so these do not have too much of a stale feel to them. 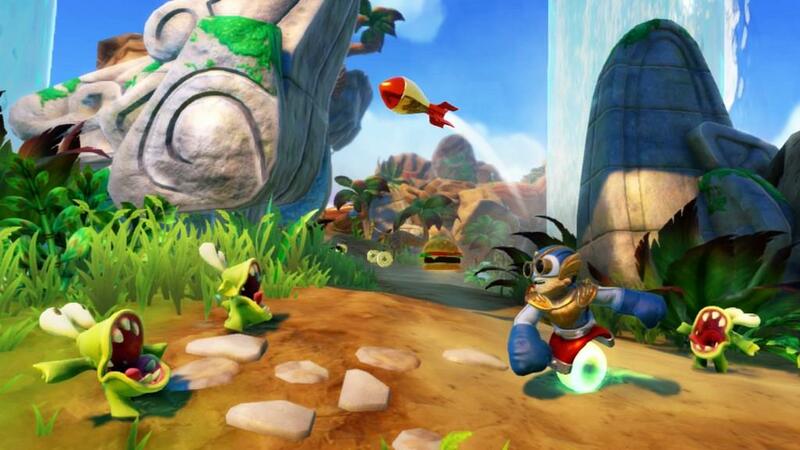 However, this tried and true design for these chapters has been carried over from the original Skylanders: Spyro's Adventure to Skylanders Giants and now to Skylanders Swap Force without much innovation. At some point, a developer of the franchise will need to make some updates to the underlying framework of how the game works to keep it fresh. As much as I enjoyed playing the game, I did come across a few things that hold it back from being an elite title. To this day, I am not sure why this franchise will not let you skip all the cut scenes on the first run. You are forced to sit through elongated dialogue that many people will find unnecessary and just keeping them from getting to the next chapter. This really needs to be addressed at some point, even if there has been considerable resources put into creating a well-scripted game with highly sought after voice actors like Patrick Warburton (Flynn). I also came across what appears to be a bug relating to cut scenes. While it is already annoying that you cannot bypass these lengthy conversations, there is an option within the menu that supposedly allows for the subtitles to be turned on or off. By default, it is on (which is silly in its own right), but when I checked it off, then on, then back off, the subtitles continued. I don’t know if this is a console specific issue or if it will be patched by a day one update, but I guess I will find out next week. The last issue I have is with the forced point of view (POV) camera angles. While the game is pretty straight forward with where you can or cannot go, it sure would be nice to be able to actually look around and not have the game dictate the camera angle views. There are several times where the POV was just plain awkward and many others where I was longing to be able to take a different look at something as I was trying to identify hidden areas or treasures. None of these issues has stopped me from playing and enjoying any of the previous versions, but much like getting the ability to jump put in place for all characters, this would make the game that much more enjoyable. Overall, the Story Mode is still the main catalyst for Swap Force and what ultimately draws you in and keep you playing. The addition of jumping for all characters, lengthened chapters and more stuff to find allows Swap Force to maintain its roots, but provide a more robust experience. However, the downside is that more of each type of Skylanders is required in order to complete each area with 100% or you have to go back and play it again once you add the missing figurines to your collection. I admit I was bit disappointed that we didn’t see any fundamental changes to the story mode game play (same stuff, different skins and mini games), but with this franchise, the figurines drive the game and not the other way around. There is definitely a comfort zone here on how to play, upgrade and navigate your way through the game that returning players and new players alike will appreciate. The three that open up as you progress through the game allow you to work on your skills and earn more stars. The two that you can play locally with a friend also allow you to earn experience and coins. I did come across one issue that was accentuated by the use of the Swap Force characters while battling in the Battle Arena and Ring Out modes. In Giants, when you had a couple of characters at different levels, you could leverage the skill set of one of your Skylanders against the greater experience level of your opponents and still have a “fair” fight. With the Swap Force Skylanders, you can throw this approach pretty much right out the window. After spending a few hours going against my seven-year old son, it was apparent that any PvP battles between Swap Force characters that are not closely matched will cause issues. If the two players are not using similar leveled and upgraded Skylanders Swap Force characters, there is a definite disadvantage for the player with the lower ranked character that is hard to get past. As I mentioned, you used to be able to overcome this by choosing a Giant or base character that you could use as an advantage over your opponent (like a speed character vs. a slow, but powerful character.) Now, you have to sit back and think through not only the base characters and their levels and skills, but also what combination of Swap Force will work against the opponent’s choice. In the future, the developers may want to add a leveling feature in the arenas, especially as you play against competition on Xbox Live. That way someone isn’t walking into a buzz saw of an opponent that is maxed out and clearly superior. Despite the competition sometimes having as advantage, I believe that there is just enough of these PvP, Solo and Team modes to keep it honest, but not enough to detract from the franchises main driver, which is the story mode. While I enjoyed playing Skylanders Swap Force just as much as I did the original and Giants, it felt like this was the title that should have taken the franchise in a new direction to keep its audience’s attention. 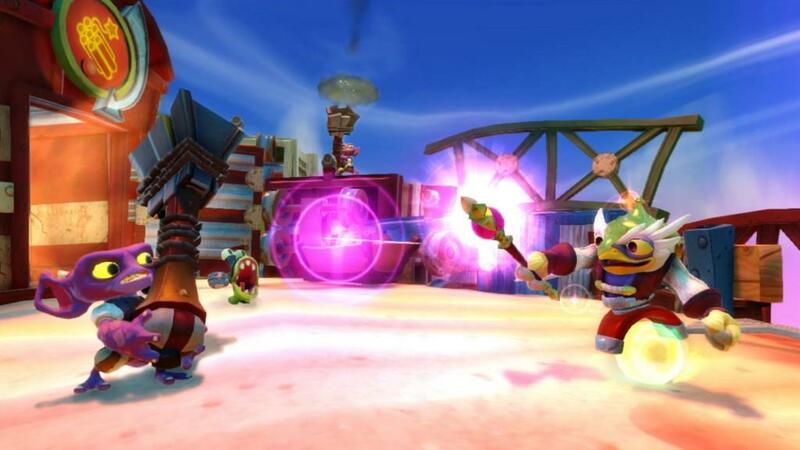 Instead, Vicarious Visions and Activision stuck with the safe route and just cleaned up a few lingering complaints from the previous versions and added into the game the Swap Force Skylanders unique playability. 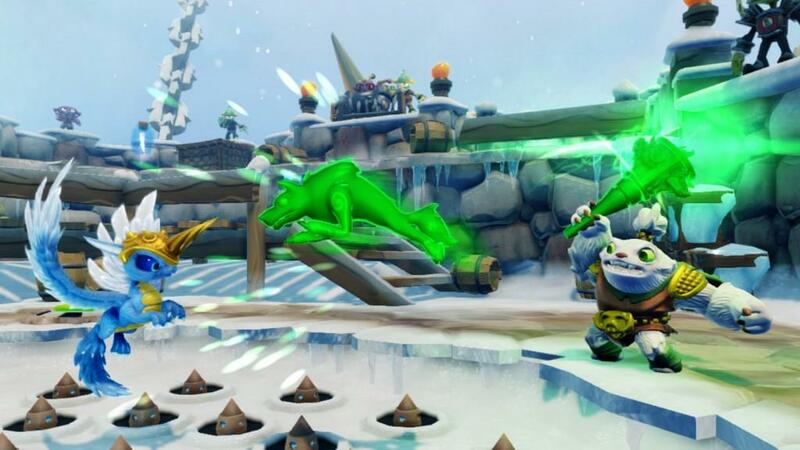 Although these Swap Force characters are enough of a diversion to keep the game somewhat fresh, Skylanders Swap Force ultimately feels like a copy of the two previous titles with a fresh coat of paint, which may or may not be a bad thing depending on your history with the franchise. However, please do not confuse my concerns about the long-term health of the franchise as an indictment against Skylanders Swap Force, because that is not my intention. This game is really good, builds on the previous titles and adds some new wrinkles that do keep things somewhat changing and fresh. Just like the previous titles in the franchise, there are a few things that hold it back from being the best it can be, but nothing that will diminish how fun and addictive it is to play by yourself or with your kids or friends. Unfortunately, the concern is that if changes aren’t made to focus more on upgrading the gaming aspect itself (instead of just driving sales with the new and re-released figurines), the franchise will slowly start to lose its appeal to the kids and parents that have grown up with it the last several years. 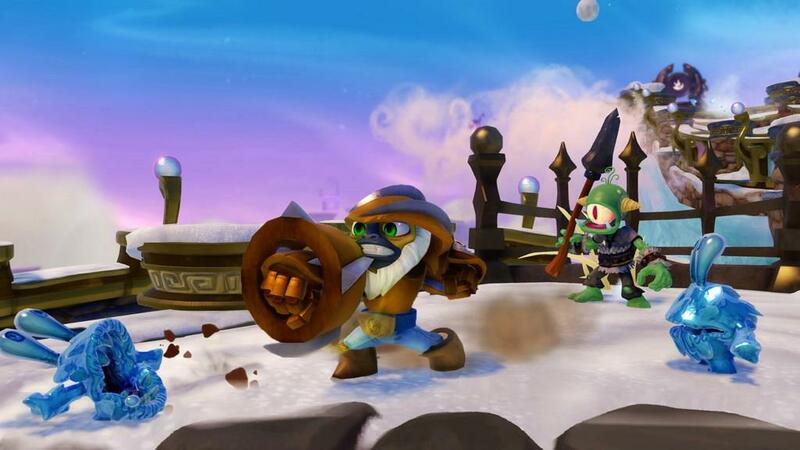 Skylanders Swap Force brings back a very familiar game with a few upgrades and a slug of new characters. Those that are huge fans of the franchise will be comfortable with this familiarity, while those that are just getting into the game for the first time will find a very fun and additive title. For either group, be prepared to add to your Skylanders figurine collection, as there are more areas than ever that require specific Swap Force, Giant or base series elemental Skylanders to unlock and complete all facets of the missions. Although I really like Swap Force and am a huge proponent of the franchise, I have concerns that if fundamental changes are not made to the game play to keep the original aging audience from the previous titles of the franchise engaged, these gamers (and their parents) will lose interest over time.